On the 6th of May, 1950, Viggo and Emil Højgård - who lived in the small village of Tollund in central Denmark - were cutting peat blocks from a nearby bog. Members of their family were working with them. People have harvested peat for fuel, from the same bog, for many centuries, going back to the Iron Age. Suddenly, Viggo's wife Grethe found something unusual. ... Mother rolled up her sleeves and started digging in the mud. She dug into the cliff where people were standing cutting peat and said: "You can say whatever you want to but there's something strange here." This image depicts Tollund Man in the bog, soon after he was rediscovered in May of 1950. Thereafter, he was retrieved from the bog and sent to the National Museum of Denmark (in Copenhagen) for detailed study. Over a hundred bog bodies are preserved up until today because of the particularly good conditions of preservation in the peat bogs. The mummified bog bodies make up around a quarter of these. In such cases soft parts of the body - like skin, hair and stomach contents - are preserved. The remaining bog bodies consist of skeletons. The most well-preserved bodies - such as the woman from Huldremose, Grauballe Man and Tollund Man - have been found in raised bogs. Here the specific acidic and oxygen-poor conditions are present, which allow for the mummification of the body’s soft parts. However, many other conditions must also be fulfilled in order to prevent micro-organisms from breaking down the human body. The corpse must be sunk in water or dug into the ground and covered quickly. In addition, the deposition of the body must occur when the bog water is cold in the winter or early spring, otherwise the process of decay can begin. Archaeological excavations have also shown that some of the bog bodies from the end of the Bronze Age and Early Iron Age were placed in old peat-digging holes and that the bodies were held down with sticks or turfs. What was the Iron Age and what time frame does it cover in Denmark? It is when people first started to use iron (instead of bronze) to make their weapons and tools. In Denmark that dates from around 500 BC to 400 AD. Image, described above, online courtesy Silkeborg Public Library. 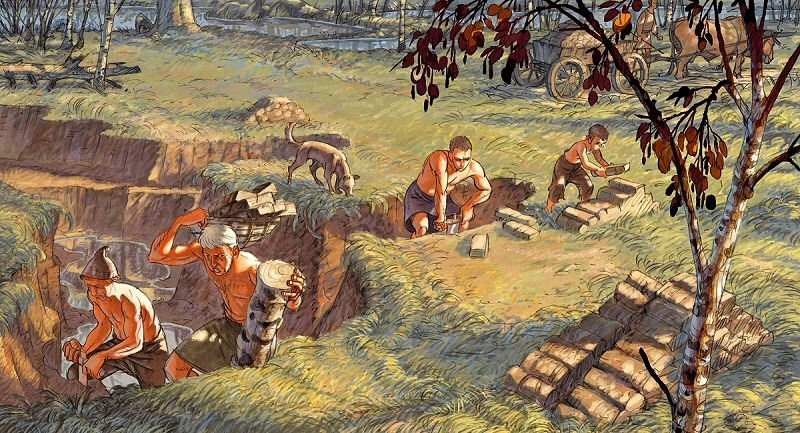 The artist’s interpretation of “Peat-digging in the Iron Age” is by Niels Bach. Copyright, Niels Bach, all rights reserved. Image provided here as fair use for educational purposes and to acquaint new viewers with the National Museum of Denmark and the Silkeborg Museum’s website on Tollund Man. Image online via Silkeborg Public Library. Bos, Carole "Tollund Man in the Bog" AwesomeStories.com. May 31, 2013. Apr 20, 2019.